item 4 NIA24 NIA 24 Rapid Exfoliating Serum (1oz) Brand New & Fresh! Free Shipping! 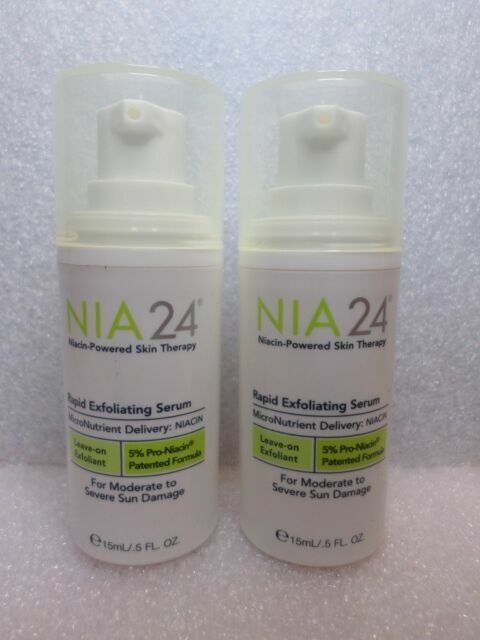 -NIA24 NIA 24 Rapid Exfoliating Serum (1oz) Brand New & Fresh! Free Shipping! What it is: A leave-on resurfacing treatment with clinical strength Pro-Niacin. How it works: Plant-based exfoliants increase and supplement skin s natural exfoliation enzymes to loosen the interlocking of cells, while Pro-Niacin works within to generate healthier skin and improve overall cell turnover. Results/Benefits: Reduces rough, dry patches that clog pores and dull skin s appearance. Improves texture, tone and sun damage. Best skin treatment ever used. After a very bad experience with a chemical peeling TCA, I was so worried about the condition of my skin, I had a huge black mark after my face peeled. The esthetician's recommended using NIA 24 Rapid exfoliating serum plus the intensive recovery cream three times a day. NIA 24 products worked wonders in my burned skin. I am using NIA 24 for 3 weeks now, and I can tell that my skin is 80% lighter. I know that I need to continue using NIA 24 for a longer time to get the best results. I love, those products, I think I am going to continue using them for the rest of my life. I like it so far, it clearseems my face from dry skin & sebum. It is so easy to use it, I mean it does not like Obagi. It does not make my skin redness at all. It makes skin more clear & shiny for me. I wear it with my daily moisturizing cream from Cetaphil because my skin is ultra sensitive. I recommend this product but try at night time first before use it 2x day & night. This serum is fantastic. Much more effective than any other nighttime serums I've used. I love how smooth, clear, and toned my face looks in the morning. It's like a good night's sleep in a bottle. I would recommend this to all.